Robin likely would have hindered his relationships by being pain-avoidant, extravagant, and fast-moving, which sometimes alternated with longing and even depression over what was lacking and missing. We believe Robin probably had strong connections to Enneagram Type 4, the Romantic/Individualist and also to Type 1, the Perfectionist/Reformer with the judging mind which raises havoc when high standards are not met. In terms of the Harmony Triads, where each triad is composed of three Enneagram points, one from each of the three centers of intelligence, Robin’s harmonic triad was most likely the 7-4-1. This triad is also know as the idealistic triad. Getting to the inhibiting central type based beliefs and avoidances, i.e., the shadows, is the incisive work that the Enneagram brings to the path of liberation and wholeness. We need to be able to do the work embedded in the Universal Growth Process, which is a practice that fosters grounded, receptive presence combined with non-judgmentalness and an appreciation for what we are and how we feel. Doing the action step of deep inquiry allows us to learn and discern what our deeply embedded, self-sabotaging central beliefs are. It’s only when we understand them that we can do the work of releasing them. Sadly, the medications he took for depression never cured Robin since they never succeeded to unearth his central issues, internal concerns, and self-defeating beliefs. Robin, if indeed in the Harmony Triad of 7-4-1, could have done the work that David Banner stated above, and if so, it is likely that he would have been liberated from the trap of believing suffering would have sunk him out of sight. Paradoxically, giving him a depression-disease diagnosis along with his own embedded fear perhaps of doing the deeper shadow work resulted in endless depression and eventually, the loss of hope. In contrast, Enneagram work creates the freedom that comes when we release engrained, defensiveness around fundamental belief patterns. Again, as David Banner put it, “I needed to do shadow work, no matter how uncomfortable it made me.” Of course, working with the issues embedded in Robin’s most-likely strong connection to the deep feelings of type 4, the ultimate idealist and the judging, critical mind of Type 1 would have supplemented the inner work of his core at Type 7. Whoever worked with him would have needed to help him accept all of himself his joys, delights, and depth of experience as well as his pain, distress, and self-criticism. *Acknowledging that Type 7 is our best estimate of Robin’s driving type, as we can not conclusively type a person based on outward assumptions. I was looking for something I’ve heard you say several times about Type 9s being the most powerful type structure on the Enneagram and came upon these observations about Robin Williams. 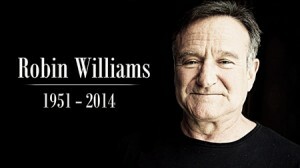 As a Type 4 with a very strong link to Types 7 and 1, I was incredibly moved by Robin’s choice to end his life. I know that feeling so well, of believing that one has to “hold the world up” with lightness and messages of hope and optimism, while feeling the pain underneath it all. It’s such a strange combination, but I know it well. As a Type 4, I can live in the sorrow more easily, but my mind is often driven to seeking options that have that quality of making my world a better place to live, endlessly restless and scheming about how to make it happen. There’s also a sense that it’s my ‘job’ to do this. I wonder if Robin’s ‘job’ to entertain the world, coupled with his depth of awareness around the suffering he was trying to alleviate, became just too much. I can also see how drugs would surely turn on him, and that embracing the shadows of 7-4-1 could have eased the pressure. I’m so very sorry that the world lost him. it has to do with anger in the form of stubbornness over what the 9 is not willing to do. Type 9s don’t recognize this readily because they want to go along with others to get along. But when they can’t, this powerful stubbornness comes up as their way of saying no, or of having their separate self. Just an added comment: While Robin’s role appeared to be that of a type 5 character for this particular movie, I still noticed his own personal 7-4-1 triad, probably because I was actively looking for it. Of course good actors can adopt different styles/patterns. And the film writer does not have to hold anyone in a particular type. Some just can’t do this. “The human spirit is more powerful than any drug, and that is what needs to be nourished,” declared Robin Williams, while playing the role of a research psychiatrist in the movie, “Awakenings”. In this performance, Robin captured the depth of feelings of type 4, which has made this a touching story. As a self-preservation type 5, I was curious to learn some science and true facts that were included in this story. Surprisingly, instead, I became enthralled by Robin’s ability to demonstrate his own powerful human spirit and strength, while he immersed himself with a potential cure for the suffering patients. His spirit was captivating in this movie, most likely energized with the zeal of his 7, the work ethic of his 1, and the inner feelings of his 4 that seemed natural, apparent, and powerful. For this reason, yes, I do think that the Enneagram could have helped Robin, because it offers first, an acceptance of self, which is a pleasant place to begin the shadow work. I think he would have acquired and maintained enthusiasm for greater happiness and a peace of mind, which he richly deserved. Thank you for this comment. Yes I too believe the Enneagram could have really helped Robin. The Seven part of him didn’t want the world to know of his suffering and he was concern, I believe, that he could face it and heal.